Marilyn Monroe’s Grave Marker Breaks All Records…Expected to Sell for $2,000, it Sold For…. 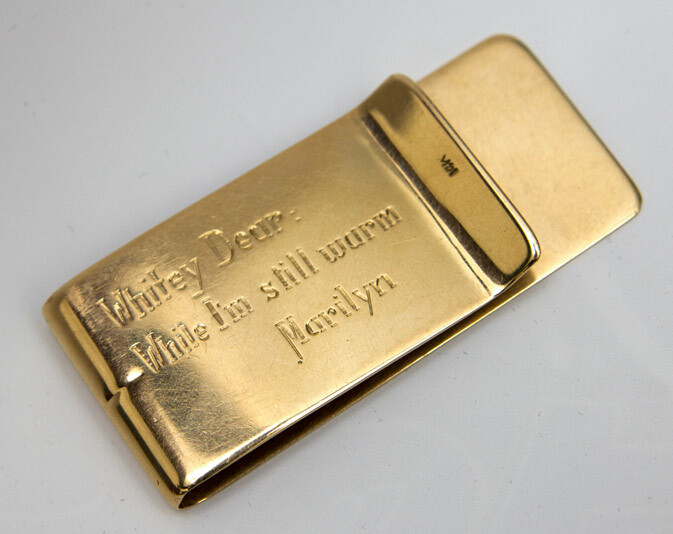 The Infamous “While I’m Still Warm…” Money Clip to Be Auctioned…Along With Lots More Marilyn Monroe Memorabilia From the Estate of Allan “Whitey” Snyder! Allan “Whitey” Snyder was Marilyn’s longtime makeup artist…he did her post-mortem makeup, but before her death, Marilyn asked “Whitey” to promise her that he’d do her makeup if she died before him. He joked, “Sure, bring the body back while it is still warm and I’ll do it.” Marilyn appreciated the joke so much, she gifted him with a gold Tiffany money clip. The inscription read: Whitey Dear – While I’m still warm – Marilyn. Sadly, by early-August of 1962, it was a joking pact that “Whitey” made good on…though he carried out his promise to do Marilyn’s post-mortem makeup, he needed a flask of whiskey to get him through the emotionally traumatic job. With a starting bid of $3,000 and a sales estimate of $6,000 – $8,000, I have a feeling that this piece will go a lot higher than predicted. As of this writing, it already has a current bid of $4,000 and the auction doesn’t begin until March 31st. Along with the money clip, there are many photos and letters from Snyder’s estate going under the hammer. Above photo: Snyder applies make up to Marilyn Monroe. With a pre-sales estimate of over $300,000 USD, previous Marilyn Monroe costumes have soared way past their expected auction estimates. Where will this iconic piece of Monroe Movie-billia go??? December 3rd will answer that question…see below for more details.